Traditional sharp character of Amaretto. One of our most popular coffees, the flavor of apricot transcends that Just Picked Flavor! The great taste of Almonds blended with Kahlua and Irish Creme. A refreshing mix of bananas and coconuts, blended with smooth undertones of vanilla. The aroma is truly exciting! Sweet banana overlaid with a hint of hazelnut and pecan flavoring. Everyone’s all time favorite dessert, banana, berry and a hint of nut makes this coffee a treat anytime of the day! Seeped in coffee liqueur and the deep richness of chocolate fudge. Delectable blackberries, enveloped in rich creme, join for an unmatchable flavor. Blueberries and spicy cinnamon partner for the flavor of a just-baked tart. Our superior coffee blend, jeweled with rich pecan flavoring. We have taken our finest Arabica beans and flavored them with olde fashion buttered rum, to come up with this all time favorite. Your taste buds will love it! Butterscotch and toffee inspires this winsome old-fashioned flavor. The great taste of Espresso and steamed milk all wrapped into one. Crown with whipped cream and a dash of cinnamon, Wow! The flavor of caramel dipped in rich velvety creme makes this a delectable cup of coffee. Gooey caramel kisses a creamy background for a delightful confection. The inspiration of caramel loaded with nutty notes makes this a treat anytime of the day. For the connoisseur of espresso with a chocolate lovers appetite, we have created this special “”brew”” combining the two. The yummy taste of vanilla creme has been added to chocolate, chocolate and more chocolate to bring you this unique and exquisite coffee flavor. Definitely for the chocolate lovers! This coffee has the deep richness of chocolate fudge flavoring. This is what makes this flavored coffee one of the most popular among “”Chocoholics””. The ultimate flavor combination of chocolate and nuts makes the perfect match for our superior coffee beans. The most exotic and costly nut has been added with chocolate to make this coffee taste exceptionally rich, smooth and nutty. The taste of rich chocolate with a hint of mint. Its a irresistable taste sensation. Rich, creamy chocolate and pecans blended with fudge makes this coffee heavenly! Treat yourself! Rich creme and chocolate, enveloped in the essence of European raspberries, results in a perfect dessert coffee. Start with rich fudge, top with chocolate and creamy caramel and complete with a sprinkle of pecan flavoring for an irresistible taste sensation. Unwrap our special blend coffee, which has been filled with our unmatchable French vanilla creme. With just the right amount of cinnamon and grahamcracker flavoring, we offer you a very distinctive coffee. It’s a real treat! Blends of spicy cinnamon, creamy chocolate and smooth almonds makes this coffee and exception. The aroma is truly divine! To make this special coffee we have flavored our special blend with spicy Cinnamon, rich Chocolate and the exotic Macadamia Nut. Enjoy a cup! The flavoring of spicy cinnamon with the background of pecans makes this coffee exciting. The aroma is intoxicating! Truly a spicy coffee! Flavored with cinnamon oil, powdered cinnamon and chopped cinnamon sticks, then topped off with orange zest. We took our finest Arabica beans, added chocolate fudge, fresh toasted almond flavor and coconut to make this yummy delight. Our finest Colombian and Central American Arabicas blended with a hint of tropical coconut flavor and deep chocolate with the hint of almonds! To our popular Breakfast Blend we have added coconut, chocolate and honey butter flavor. The beans are then rolled in rich powdered cocoa. Coconut and a hint of vanilla, along with a sprinkle of large coconut flakes, will take your tastebuds to the tropics. The flavors of sweet cinnamon, nut and pastry make this coffee a great after-dinner treat! The taste of rich vanilla custard intertwined with sweet spice – just like the Italian dessert. Buttery shortbread completed with warm spices and creamy coconut. Sure to become one of your elected coffees! Just in time for the most romantic holiday of the year! We have combined two of our exciting flavors; creamy, dreamy Chocolate and the exotic Macadamia Nut with a hint of spicy Cinnamon. Enjoy a cup with that special someone! “If you enjoy the intensity of chocolate fudge, you will love the double excitemtn of this flavor. If you enjoy the intensity of vanilla, you will love the double excitement of this flavor. “Creamy, dreamy orange and a hint of vanilla makes this coffee a smooth, flavorful treat. We’re sure this flavor will quickly become one of your favorites! We have started with Dutch Chocolate topped with warm chocolate fudge and vanilla flavor to come up with this irresistible flavor! A wave of luscious almond and rich Dutch chocolate highlight this rush of flavor. The taste of vanilla creme and Dutch Chocolate makes this coffee a real delight and great anytime of the day! 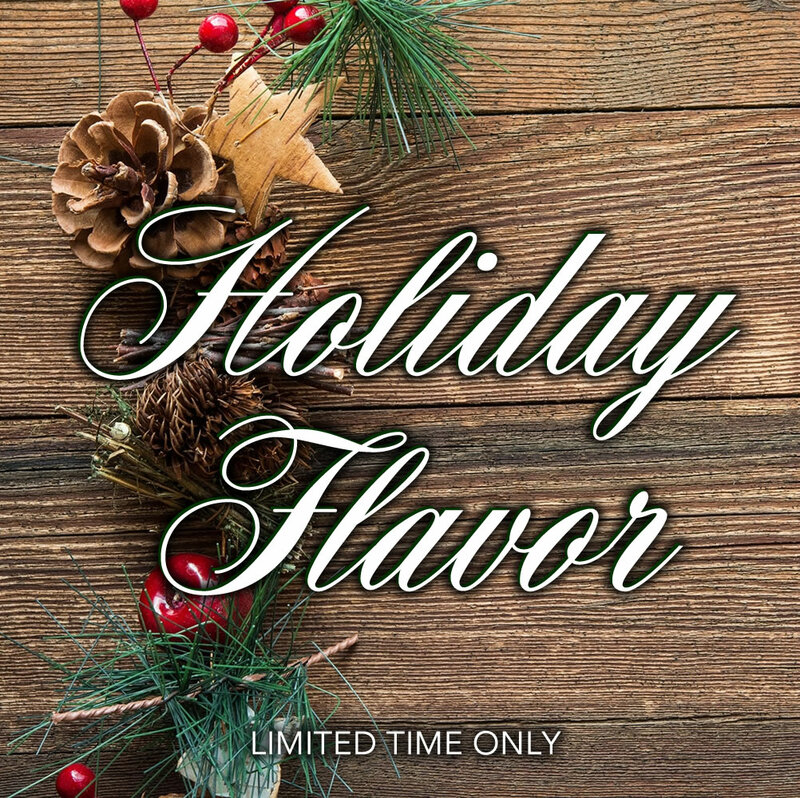 Start a holiday tradition with our finest beans, which have been blended with rum and spice. Fragrant and well rounded with smooth brandy character. Just the right amount of sweet spices to enhance this warm, buttery coffee. Indulge in the aroma of maple and cinnamon that takes your senses on a romantic holiday. The intense flavor of slivered almond combines with the freshness of vanilla to tickle your palate. Like Mom’s just-out-of-the-oven, homemade brownies, this coffee will make you want more! Treat yourself today! If you love the cake, you will love this coffee, layered chocolate and coconut with a touch of dark roast. A lavish flavor creation of chocolate, coconut and hazelnut. You will dream of the islands with this blend of large coconut flakes and macadamia nut flavor. The highest quality hazelnut flavoring gives this coffee its classic nutty flavor. Butterscotch with a hint of liqueur, crowned with a dash of spice, ignites this exciting Irish flavor. This sweet, fulfilling coffee has been flavored just enough with honey maple praline flavoring and a touch of pecan. Its a real treat! The essence of Irish creme liqueur makes this coffee a favorite after dinner treat. Kahlua and Vanilla Creme combined with the sweetness of creamy caramel make this coffee a delectable treat. The savor of macadamia makes this coffee rich, smooth and nutty. The sweetness of maple is prevelant in this flavored coffee. We have added a hint of nut fudge flavorings for extra smoothness. The aroma is intoxicating. The sweetness of maple flavoring is prevelent in this flavored coffee. We have added a hint of walnut for extra smoothness. The aroma is intoxicating! Everyone’s favorite dessert, chocolate fudge brownie, topped with nuts, chocolate frosting and coconut flakes! Our finest beans dipped in a dreamy combination of chocolate fudge, coconut and a splash of orange. A blend of smooth, fine chocolate with a cool, refreshing mint flavor leaves the palate tingling. Morning or evening this coffee is satisfying! A Neighbors original fusion of cinnamon and nut flavoring in milk chocolate bursts into an unexpected sensation. You’ll want to indulge in this scrumptious taste of nutty chocolate and toffee! A delicate, sweet cherry flavored coffee with pieces of Seville oranges. Our secret recipe, handed down from our Irish uncle, mixes creamy fudge with warm spices for a one-of-a-kind concoction. The old fashioned flavor of peanut butter blends with chocolate for a melt in your mouth treat! Take the flavor of a pecan praline, add a dollop of cream and enjoy the flavor of a southern Creole delicacy. The wonderful combination of sun ripened raspberries and danish pastries amkes this coffee simply delicious. Smooth undertones have been added for that extra treat! We have blended chocolate, caramel, marchmallows and creme flavorings to arrive at this popular flavor. The results are truly rewarding! An all time favorite, creamy marshmallows and sweet chocolate sandwiched between graham crackers. A great treat! Crispy, juicy apples with a splash of warm brandy makes this the perfect compliment to a plate of homemade cookies. Santa’s favorite! Get lost in the magic of the season with succulent fudge draped in chocolate and caramel then sprinkled with pecan flavoring. The combination of our ultimate flavors, French Vanilla Almond and Praline & Creme, produces a smooth nutty flavor that is quite tempting. This fragrant coffee lets you enjoy the taste of spice butter rum flavoring. The aftertaste is that of sweetness and a pleasent “”holiday”” feeling all year round. Treat yourself to this delightful flavored coffee. We started with our premium blend, added a touch of strawberry and then topped it with creme. Enjoy! Start the day with the taste of a fresh pastry and coffee all wrapped up into one! We have taken equal parts of cream pudding, orange flavoring and dusted it with cinnamon. Treat yourself! Just like the Italian dessert, this coffee captures the flavor of ladyfingers, Marsala wine and Mascarpone cheese. The intensity of roasted almond flavoring gives our special blend a crisp nutty flavor. The flavors of toasted pecan, sugar and cream combine superbly in this scrumptious toasted praline experience. Let the tropical taste of this fine blend take you away. Creamy coconut with just the right hint of other exotic flavorings, sure to become one of your favorites. Treat yourself! A wonderful combination of vanilla and hazelnut flavoring.